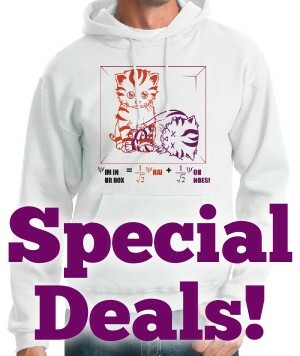 A math joke t-shirt featuring the Banach-Tarski Paradox. The Banach-Tarski Theorem is a surprising consequence of the Axiom of Choice. It says a ball can be partitioned into finitely many pieces which can be rigidly rearranged to produce two balls of the same radius as the original! This violates our physical expectations since physical pieces would exhibit conservation of mass and volume. 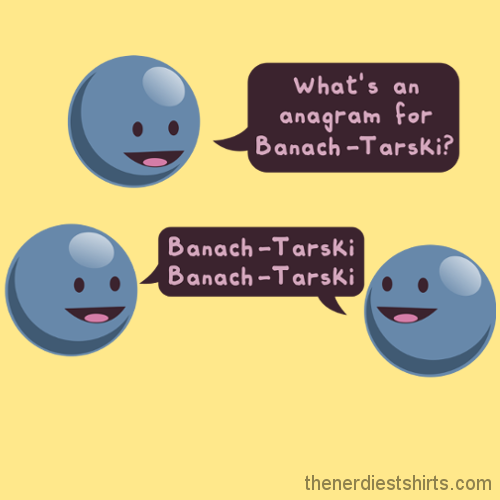 Our Banach-Tarski shirt presents this result as a joke about rearranging the letters of "Banach-Tarski" to produce "Banach-Tarski" twice. • At our Special Deals store for great prices on select shirts. • At our OnlineShirtStores store for a wide variety of shirt colors and styles.